Our 2000+ sq. ft. home features pastoral views from most windows. In addition to our domestic animals there are several wild ones that seem to consider this place their home. The house features a kitchen and den that open to an outside deck for dining or just hanging out. The separate living room is a good place for reading a book or playing games. The dining room is where everyone gathers at once. Our home has sleeping accommodations for up to six adults. There is an upstairs master bedroom with fireplace and private bath. Across the hallway is a second bedroom and another full bath. Both rooms feature Queen beds. Downstairs is a powder room and a smaller bedroom with twin beds, which can be made into a double on request. Please let us know on booking if you wish that option. You will find soap, lotion, shampoo, conditioner and a hair dryer in each bath. We provide some basic kitchen items - spices, olive oil, balsamic vinegar, etc. so you don’t have to buy them. There is a gas outdoor grill. And a metal fire pit on the front patio. No other fires are permitted on the premises. Maybe you have been working hard and want to relax, read a book, nap in the pond-side hammock or just enjoy the quiet beauty. Or perhaps you are traveling with family and the kids want to get their hands dirty in the barn or the garden. We will gladly accept an offer of help. So, about the quiet beauty. Our views are pastoral. The perimeter is mostly surrounded by old-growth trees and home to many species of birds. Deer often graze alongside our horses. The only human sounds you’ll hear will likely be yours. Our family members are horses and dogs and cats. Your pet is welcome with prior arrangement. Please note that your dog must be kept on a leash and never left alone in the house for more time than it takes to have a meal out. We have a dog bed so you won't need to bring one. If you are traveling with a toddler, we have a Pack N Play and a high chair for your little one. When the hens are in the mood for laying, fresh eggs will be available for your breakfast. You are encouraged to help yourself to our delicious organic salad greens from the garden. We offer Wi-fi, many DVD movies and Netflix instant download should you have time for entertainment. And Pandora Radio for music. Our home isn't fancy - just cozy and comfortable like a farm house should be. We ask that you conserve water when possible. Guests are welcome to walk anywhere on the property but must be accompanied by the manager when near the horses and barn. Swimming in the pond is prohibited. There is a hammock for two wanting of occupants next to Rowdy's Pond. Our neighborhood is close to town yet private and quiet. Walking about is a favorite past time of friends and guests. Any area past the obvious perimeter fencing is not part of the farm. We ask that when walking you stay on the easement drive-way or public roads. We have some old bicycles to offer if you like to noodle around that way. If you have infant children, we have a Pack and Play and a highchair for your use. ARE YOU TRAVELING BY FERRY? RESERVATIONS ARE RECOMMENDED DURING THE TOURIST SEASON. CLICK ON THE LINKS FOR MORE INFORMATION OR YOU MAY CONTACT CLAUDIA IF YOU HAVE QUESTIONS. Click on the right side - Guest Users - make a reservation. CHECK-IN time is after 4 p.m.
CHECK-OUT is prior to 10 a.m.
On some occasions these times may be extended - please ask. Our manager lives in separate quarters on the farm. Please let Claudia know how she can assist you in making your experience on San Juan Island and Over the Hill Farm be great and one you will want to repeat. Private, yet less than two miles from the town of Friday Harbor. For driving instructions see property description, scroll to the end. Keurig. You bring the pods. Olive oil, vinegar, flour, sugar, many spices. Basic Cable and Netflix instant download. There are tennis courts at the public high school approximately one mile. Public Golf Course approximately three miles. We thoroughly enjoyed our stay. Hosts Claudia and Mike have found the right balance between respecting privacy while being available and being the true definition of hosts. We enjoyed the tranquility of the farm as well as the opportunity for our son to ride the tractor, meet the chickens, and ride a horse. We biked into town (less than a mile) and used the house as a base for hiking and driving to explore the island. The house itself is an updated old farm house. It's well appointed, comfortable, and quiet. The kitchen has the basics. There is a clean gas grill outside with the necessary clean accoutrements. There are books and DVD's available as well as some magazines. Wifi worked well as did Netflix. The bedrooms upstairs have soft mattresses and soft comfortable carpets. Bathrooms were all more recently updated and clean. It was a hot week in the PNW and the fans in the bedroom were certainly welcome. Over the Hill was one of our top VRBO stays and we would not hesitate to stay there again. A delightful place to stay while visiting a wonderful spot! Over the Hill Farm is located close to Friday Harbor and is a wonderful place to stay. The farm setting, well stocked home, and friendly and gracious owners who live on the property, provided a home away from home. The tractor ride and animals were enjoyed by our young grand children and the house had everything we needed for our entire family. A memorable stay with hopes to return! We had a great time at the farm. The house had everything we needed and it was inviting and comfortable. We enjoyed meeting the horses and exploring. Our boys (8 and 5) LOVED getting to drive the tractor with Claudia and shovel horse manure! That was a highlight for sure. We very much enjoyed your family staying on the farm and hope to see you again! Over the Hill Farm was the perfect getaway for our family. We brought along my son’s two best friends and the kids were in and out of the house all day long. The house was perfectly equipped with everything we needed for cooking and eating. The back deck has a grill and seating for six. The beds were comfortable and the whole home was very clean. Claudia and Mike were lovely hosts. Mike introduced the kids to the horses. Claudia brought us to the garden where we were invited to use anything we wanted in our cooking. We had a wonderful visit at Over the Hill Farm. Claudia and Mike were great hosts, introducing us to the animals, showing us around the farm, sharing their delicious salad greens. There were so many places to sit and relax, inside and out. A fire pit and skewers for s'mores. 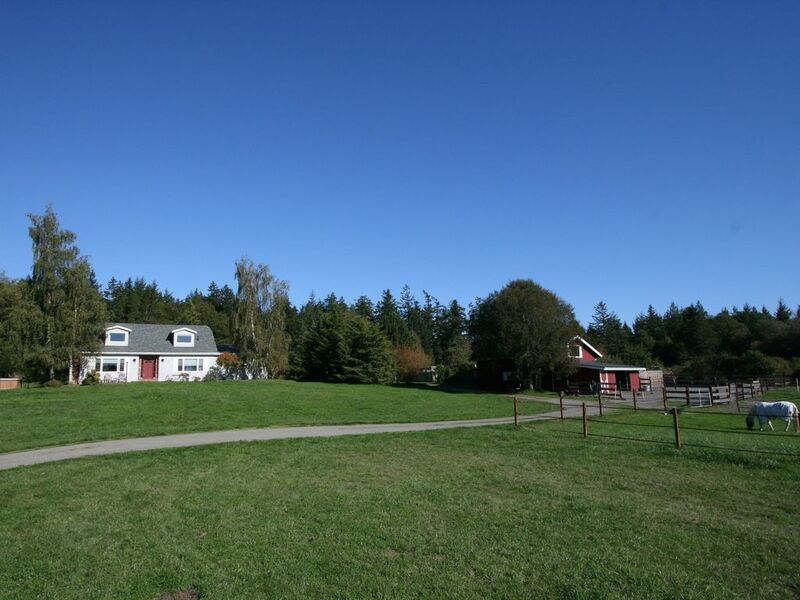 I loved the location close to Friday Harbor, but farm setting so we could relax with a sense of space and go for walks without a lot of car traffic. Our kids had a great time as well. There was space to run and explore. Our kids can be especially chatty and curious. Claudia and Mike were great talking with them, teaching them about the farm and giving them a tractor ride after they helped rake the manure. I laughed out loud when my daughter ran up to me and asked excitedly "Can I go to the manure pile?" Great visit! Perfect getaway for our family of 5! Cynthia was an amazing host and showed my kids around the farm. They loved interacting with the horses, chickens, dogs and cats. She made my kids feel so special. The house was cozy and perfect. The fact that the bathrooms and kitchen are stocked with basic necessities makes it so easy. We are already planning our next getaway to the farm! It is advised that you make ferry reservations in both directions far in advance of your check-in date. There is usually space for drive-ons but you would need to arrive at the terminal at least 1 1/2 hours before departure, and even then with no guarantee. Much easer to be assured a space. The schedule for your dates and the times will be available. After choosing your departure time you will be asked to login as a guest. You are booking from Anacortes to Friday Harbor. If there are no reservations available for your dates, there are two tiers that will open at 7 a.m. (1) two weeks prior to your travel date. (2) Two days prior to your travel date. Would suggest you be ready on your computer at 7 a.m. to get the ferry you want. You must be at the ferry kiosk 30 minutes prior to your departure or you could lose your reservation and have to wait in line. If you are having difficulty, please let me know and I will be happy to assist you.